The mischievous Cherkassky left behind numerous live performances � and the memory of a good many more. 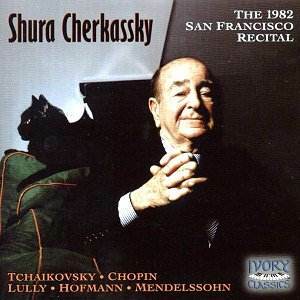 This recital, given at Davies Symphony Hall in San Francisco, was recorded in 1982 when he was seventy-one and includes examples of his large and quixotic repertoire, though ones which will resonate for many as essential Cherkassky fare (I�d clearly exclude the unexpected Lully). It was clearly a memorable evening and we can share it in Ivory Classics� well-produced disc. Cherkassky and Lully don�t seem especially promising disc fellows but he makes something delicate out of the Air tendre and in the Courante, albeit with left hand strongly subordinate to right, one feels that its romantic tracery is strongly to the pianist�s liking. The Sarabande has a veiled touch in which he sees it through a Romantic prism � it hardly needs saying that this performance is rooted strongly in romanticised procedures of beauty of touch and sound. Cherkassky�s Grand Sonata can be profitably compared with that of a fellow Russian contemporary such as Richter. Cherkassky catches the moments of grotesque and quixotic writing as well as the drive of the opening movement. There are also moments of sheer lyrical gorgeousness, special to Cherkassky, though he never replicates Richter�s commanding drive and sense of linear intensity. There really couldn�t be more of a contrast between Cherkassky�s insinuating coquettishness in the slow movement and Richter�s powerful depth. The former�s pecking articulation and smooth emotional largesse will infuriate those who value Richter�s imperturbable incision but in the context of his performance Cherkassky covers a great deal of emotive ground. He certainly uses plenty of pedal in the bustly Scherzo and the two Russians diverge again in the finale � Richter is all incandescence and drive (but what clarity of passagework) whereas Cherkassky is more measured with somewhat italicised phrasing. Perhaps my more Puritanical side inclines me to Richter but there�s no gainsaying Cherkassky�s humanity in this Sonata. He was certainly heading toward caricature in the Polonaise Fantasie in which the phrasing and voicings are more Cherkassky than Chopin � a pity because as his early 1940s recordings, also on Ivory Classics, quite clearly show he wasn�t always this feline and capricious when it came to Chopin. He plays his teacher Hofmann�s Kaleidoskop with real gusto however and ends the recital with more Chopin, this time the A flat major Waltz. Once again the pointing is naughty and the playing almost entirely externalised but one can forgive him these moments of whimsy for the pleasure he brings elsewhere. I don�t think this is quite the recital that some have made it out to be. There are so many touches of eccentricity and indulgence that one has to reserve absolute critical judgement. But Cherkassky was incapable of being dull and he was ever mercurial and this concert certainly captures these and the other puckish characteristics of this unpredictable lion of the piano.